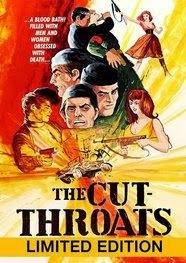 BUT if you pre-order the May package you will also get (VS-080) THE CUT THROATS FREE. Pre-order the May package here. At the close of WWII, an elite squad of American soldiers infiltrates a remote Nazi outpost with the intention of stealing battle plans and ending the war early. Unknown to his troops, the American Captain’s real motives for attacking the compound is to steal a hidden cache of Nazi jewels. In a bloody attack the soldiers storm the base, and discover beautiful Nazi women. The Americans take them as prisoners, but can they overcome their sexual desires and fulfill their mission? Will their corrupt officer let any of his troops make it out alive? Directed by John Hayes (Baby Rosemary, Grave of the Vampire), THE CUT-THROATS is an early hybrid of Nazisploitation and sexploitation coming to DVD for the first time!